I hope you enjoy reading my new and interesting facts. Please leave a comment or maybe tell me your interesting facts. I will add to this page with more ideas, so please take another look when you next visit our blog. Fact 1: When you remove the Kings, Queens, Jacks and Joker cards from a deck of cards, then add the remaining card values together – it totals 220! 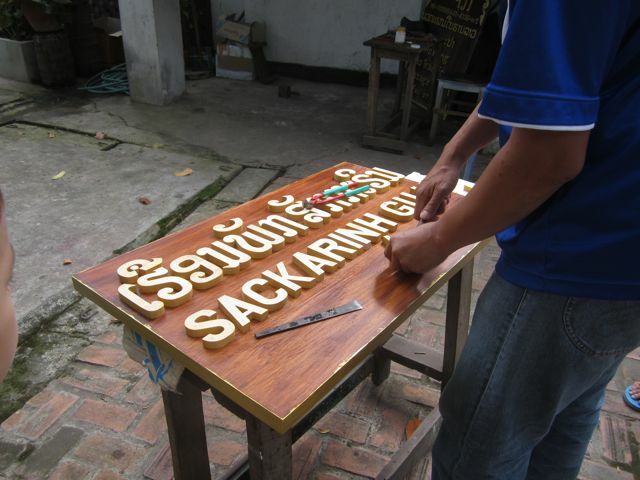 Fact 2: All the signage is made by hand in Lao, not by machine. I have watched several being made. Fact 3: We have invented a category system for Laos Tuk Tuk’s. The categories we have come up with are 3A, 3B, 3C, 3D, 4A and 4B. The number refers to the number of wheels on the vehicle. The letters refer to the different types of body. We don’t see 4B’s much because they are usually seen in the mountains. I will try to get some pictures around town to show you. The C in the term 3C stands for customised body work. Fact 5: Most of the motorbikes in Luang Prabang are Honda Waves. Fact 6: The e-rickshaws in New Delhi are in a grey area in regards to the law. That’s because these rickshaws are registered as electric vehicles running on 250 watt motors and hence are non-motorized transport beyond the ambit of the Delhi Motor Vehicles Act. But because they run on elelctricity they do not release fumes, are quiet and are eco-friendly. Fact 7: The word Byzantium besides being the ancient name of Istanbul, Turkey is also the name of a modern colour – a dark tone of Purple. Fact 8: Albert Einstein, the most recognised scientist in the world, was German and born in Ulm. He married his cousin. Fact 9: There is a law in Switzerland stating that local governments must provide nuclear shelter space for all citizens. Fact 10: No proper restaurant in France will serve ice in your water. Most of the time, the water will be either room-temperature or slightly chilly, but never cold. Fact 11: Belgium has more comic book creators per square kilometre than any other country in the world. I like your tuk-tuk classification. I hope you will add photos of interesting vehicles in other countries that you visit. Thanks Dan. Maybe I will? Do you have an interesting fact to tell me? Lucas. Your observations are very astute, most accurate and well photographed. We both are very proud of you Lucas. Your loving Uncle Paul-John and Grandma who is missing you.xoxo.. Thanks for your great comment. I have entered a new interesting fact today. I hope you read more of my facts in the future. It is very amazing picture that I never seem before . Fact: For baby boys in 2013, Lucas was the 4th most popular name in the USA and the 7th most popular in Australia. Dear Lucas, I have enjoyed reading your page, and seeing the classification system you have for tuk tuks, When I have travelled in SE Asia I have always been astounded at the numerous varieties of them. And they are mostly so beautiful. Vehicles in the UK (where I live) and Australia aren’t even halfway as attractive as tuk tuks! I see that Reuben has drawn a tuk tuk. Is it a 3C? Thank you for looking at my page. Technically the tuk tuk on Reuben’s page is a ‘3A’ because the windscreen turns with the handlebars and front wheel like a motorbike. A 3C means it has a fixed front windscreen and customised body work at the back. Dear Lucas and Reuben, I hope you remember me and my friends met you in Massori (india). We really had a very good time with nice Vodka and awesome weather. Hope to see you again in India. Of course we remember you. Thanks for following our travels. Great to have you along :). Keep in touch.